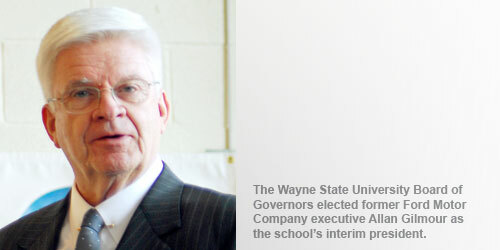 The Wayne State University Board of Governors has unanimously elected former Ford Motor Company executive Allan Gilmour as the school’s interim president. Gilmour spent nearly 35 years with Ford, retiring as vice chairman and CFO in 1995. He rejoined Ford in 2002 as CFO before permanently retiring in 2005. Gilmour publicly announced that he is gay in an exclusive Between The Lines interview just after he first retired in 1995, making him the highest ranking corporate leader in America to come out publicly. Since then, he has become a leader and major funder of Michigan’s LGBT community. Gilmour was one of the first donors and organizers of the HOPE Fund at the Community Foundation for Southeast Michigan, now one of the state’s largest funders of LGBT projects. He and his partner Eric Jirgens co-chaired the Affirmations Capital Campaign that raised $5.3 million for the new center in downtown Ferndale. Former WSU President Jay Noren announced his resignation July 20, effective Aug. 6, after two years in office. His decision, Noren said, was so that he can be closer to his wife, Sheri, a provost at Illinois State University in Normal, Ill., who was diagnosed with breast cancer earlier this year. Phyllis Vroom, dean of WSU’s School of Social Work and acting provost, was appointed acting president until an interim president could be named. WSU Board Chairman Richard Bernstein called Gilmour the right person “at the right time, in the right place” to lead the university through its transition period. Gilmour continues to serve as a director on various community and corporate boards, including DTE Energy, the Community Foundation, Henry Ford Health System and Dow Chemical.